Famous Sunset Beach in Los Angeles has a few permanent residents now (in the water), who have taken to leaping skyward on a regular basis, fascinating surfers and local land folk. Great white sharks they are, and this species is not known to breach, says researcher Ralph Collier. It would be great to know why the Sunset sharks are breaching ... They are not "playful," per se, as dolphins are, and this behavior is puzzling experts. 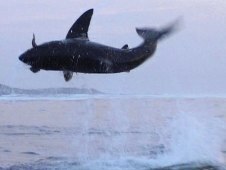 White sharks will lunge out of the water if they're trying to catch a seal, but doing so without prey in sight is rather unusual. It is theorized that some animals breach to loosen their skin of dead cells and barnacles from the impact of landing ... Could the sharks at Sunset be breaching because of something on their skin? On August 22, 2010, two surfers reported to the Shark Research Committee: "We were waiting for waves just south of the parking lot when we saw this 8- to 10-foot shark breach completely out of the water near the buoy. At its peak, the entire body of the shark was at least 3 feet above the water's surface. Then it flopped into the water with a big, thudding splash. It had none of the grace of a dolphin." Hanging out at Sunset and watching to see if GWS 1 or 2 shows itself is becoming popular. There seem to be two large ones, and others may be in the vicinity as well. Overall, shark sightings are rocketing on the West Coast -- a sign of a healthy comeback after Jaws compelled people to hunt them down and make exhibits of them. 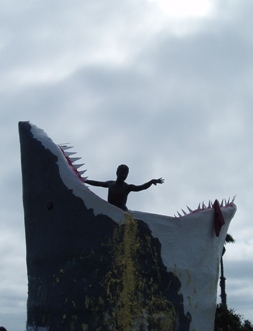 Photos of the "Gladstone shark" (as the Sunset Beachers are called) can be seen here. A Navy helicopter squadron saw the incredible creature (see photo below) in the water about 200 miles off the coast of Delaware. What kind of shark is it? 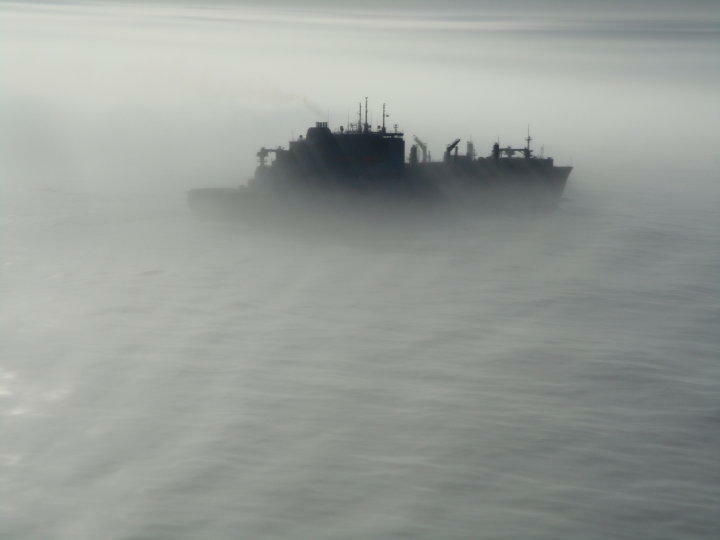 The story, as recounted by the pilot who wrote to us: "The scene was a little surreal as the fog was thick and our two ships were moving in and out of the fog banks. The water was really glassy and clear which surprised me. As we were waiting for the ships to move out of the fog so we could land, we were surprised by how many dolphins were out in the water. I would say I saw anywhere between 20 and 40 dolphins swimming in various sizes of pods. This totally amazed me, as I have only seen dolphins when surfing or paddleboarding at the beach. 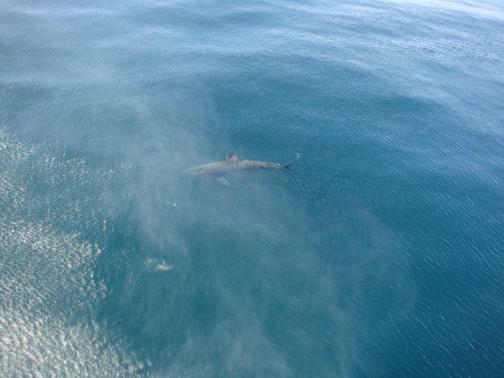 Although it's possible this was a white shark, at 30 feet it would be perhaps the largest on record. Chances are it was a basking shark, which can get as big as 40 feet. Basking sharks migrate long distances and feed at the surface. One of three species of very large krill feeders, their jaws unhinge to produce a gaping mouth with hundreds of tiny teeth. Click here for more information and to watch a great video of basking sharks swimming and feeding. 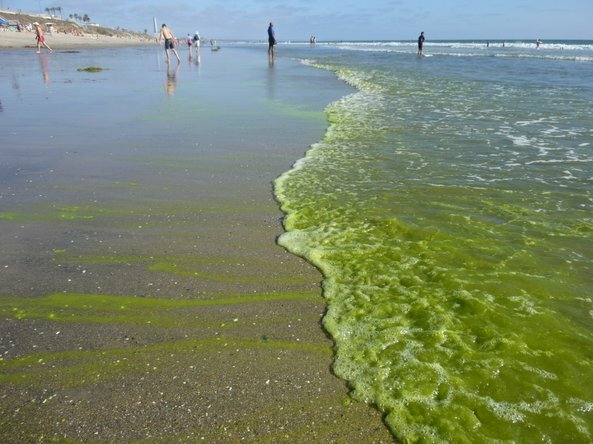 The ocean water lapping the San Diego beaches has been dropping as low as 57 degrees. For the height of summer, it's extremely cold. The water has been extraordinarily chilly since July, with only a brief spike in early August. 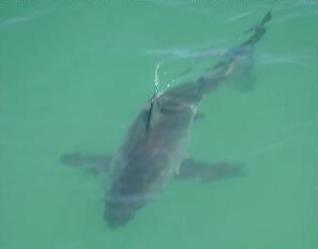 On Sunday (8/15) a great white shark was spotted off La Jolla Shores. It was said to be longer than the 12-foot kayak being paddled by the person who saw it. What is going on? "They've always been here," people are saying. Lifeguards warned ocean users about the sighting (actually two sightings -- 9:30 a.m. and 5 p.m.) and urged the exercise of caution and judgment about getting in the ocean. A damper was the frigid water temperature (not even 60 dF) and the heavy cloud cover (caused by a cold ocean at this time of year). The morning sighting was reportedly 2 miles off shore (is that really signficant? I wondered), and the afternoon sighting was a mere 50 yards from Tower 30 at La Jolla Shores. White sharks have good marine vision, but not in murky water. A mature white shark's preferred food is the pinniped (young adults eat seals, bigger adults eat sea lions). And cold water with lots of food is a nice hangout for big white sharks. La Jolla has busy beaches full of bathers, swimmers and kayaks, as well as plenty of lounging seals. Where the prey is, the predator follows. Put the murky water together with a food supply, cold temperatures, and people-activities unfamiliar to a shark, and you may get the formula for an up-close-and-personal visit ... Read through the site and you'll understand how it all goes together! See our Navy Warfare Testing section for more about the strangely cold water.